White meat is meat which is pale in color before and after cooking. The most common kind of white or light meat is the lighter-colored meat of poultry, coming from the breast, as contrasted with dark meat from the legs. In traditional gastronomy, white meat also includes rabbit, the flesh of milk-fed young mammals (in particular veal and lamb), and pork. In nutritional studies however, white meat includes poultry and fish, but excludes all mammal flesh, which is considered red meat. The United States Department of Agriculture classifies meats as red meats if the myoglobin level is higher than 65%. [dubious – discuss] This categorization is controversial[weasel words] as some types of fish, such as tuna, are red when raw and turn white when cooked; similarly, certain types of poultry that are sometimes grouped as "white meat" are actually red when raw, such as duck and goose. Poultry white meat is made up of fast-twitch muscle fibres, while red, or dark, meat is made up of muscles with fibres that are slow-twitch. Within poultry, there are two types of meats—white and dark. The different colors are based on the different locations and uses of the muscles. White meat can be found within the breast of a chicken or turkey. Dark muscles are fit to develop endurance, or long-term use, and contain more myoglobin than white muscles, allowing the muscle to use oxygen more efficiently for aerobic respiration. White meat contains large amounts of protein. Dark meat contains 2.64 times more saturated fat than white meat, per gram of protein. One commentator wrote that dark meat contains more vitamins, while a New York Times columnist has stated the two meats are nearly identical in nutritional value, especially when compared with typical red meat. For ground-based birds like chicken and turkeys, dark meats occur in the legs, which are used to support the weight of the animals while they move. According to the U.S. Department of Agriculture, one ounce of boneless, skinless turkey breast contains about one gram of fat, compared with roughly two grams of fat for an ounce of boneless, skinless thigh. The numbers go up when the skin is kept in: a chicken thigh, with skin intact, has 13 grams of total fat and 3.5 grams of saturated fat per 3-ounce serving; this is about 20 percent of the recommended maximum daily intake. Birds which use their chest muscles for sustained flight (such as geese and ducks) have dark meat throughout their bodies. Because of nutritional concerns, it can be preferable for meat producers to have their products considered white meat. The United States National Pork Board has marketed their product as "Pork. The Other White Meat". In Israel, where Jewish dietary laws which forbid the consumption of pork are popularly practiced, "white meat" is the accepted euphemism for pork. The health effects that correlate with white meat consumption have been studied as compared to red meat and vegetarian diets. There is a decreased incidence of stroke. There is no association with obesity or insulin resistance. White meat appears to have a neutral or favorable effect on blood coagulation profiles. ^ Evan Goldstein, Joyce Goldstein, Perfect Pairings: A Master Sommelier’s Practical Advice for Partnering Wine with Food, ISBN 0520243773, 2006, p. 109: "White meats such as pork and veal are also excellent table companions for Gewürz..."
^ Pierre Paillon, Secrets of Good French Cooking, ISBN 0471160628, 1996, p. 95: "White meats (veal and pork) and poultry should be cooked "medium"..."
^ Elisabeth Rozin, The Primal Cheeseburger: A Generous Helping of Food History Served On a Bun, ISBN 0140178430 1994, p. 19: "Beef and lamb are clearly red meats, while veal and rabbit are white meats; the white meat category has been generalized to include the flesh of poultry and fish as well." ^ "USDA-Safety of Fresh Pork...from Farm to Table". Fsis.usda.gov. 2008-05-16. Retrieved 2009-09-16. ^ Lee, Elizabeth. "The Truth About Red Meat". Web MD. Retrieved 12 October 2014. 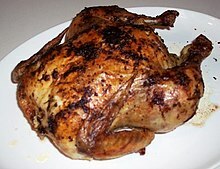 ^ "Dark Meat Versus White Meat: What's The Difference". Retrieved 2012-02-20. ^ "Come To The Dark Side Of The Chicken; It's Tastier". Retrieved 2011-02-26. ^ Anahead O'Connor, "Really? The Claim: White Meat Is Healthier Than Dark Meat" Archived April 6, 2016, at the Wayback Machine in the New York Times, 20 Nov 2007. ^ "The Nutrition of Chicken Breasts Vs. Thighs". healthyeating.sfgate.com. Retrieved 22 June 2016. ^ "Mexican Flu: The Other White Meat : On Language". The Jewish Daily Forward. 6 May 2009. Retrieved 14 September 2009. ^ Kim, K; Hyeon, J; Lee, SA; Kwon, SO; Lee, H; Keum, N; Lee, JK; Park, SM (30 August 2017). "Role of Total, Red, Processed, and White Meat Consumption in Stroke Incidence and Mortality: A Systematic Review and Meta-Analysis of Prospective Cohort Studies". Journal of the American Heart Association. 6 (9). doi:10.1161/JAHA.117.005983. PMID 28855166. ^ Dabbagh-Moghadam, A; Mozaffari-Khosravi, H; Nasiri, M; Miri, A; Rahdar, M; Sadeghi, O (December 2017). "Association of white and red meat consumption with general and abdominal obesity: a cross-sectional study among a population of Iranian military families in 2016". Eating and weight disorders : EWD. 22 (4): 717–724. doi:10.1007/s40519-017-0385-x. PMID 28421475. ^ Cocate, PG; Natali, AJ; de Oliveira, A; Alfenas Rde, C; Peluzio Mdo, C; Longo, GZ; dos Santos, EC; Buthers, JM; de Oliveira, LL; Hermsdorff, HH (February 2015). "Red but not white meat consumption is associated with metabolic syndrome, insulin resistance and lipid peroxidation in Brazilian middle-aged men". European journal of preventive cardiology. 22 (2): 223–30. doi:10.1177/2047487313507684. PMID 24104887. ^ Mann, N; Sinclair, A; Pille, M; Johnson, L; Warrick, G; Reder, E; Lorenz, R (June 1997). "The effect of short-term diets rich in fish, red meat, or white meat on thromboxane and prostacyclin synthesis in humans". Lipids. 32 (6): 635–44. PMID 9208393.